Teaching our children about the Oregon State Capitol and the important work done there is a great way for them to learn not only about how government operates, but also how we can get involved as citizens to help protect and expand our homeschool freedoms. Visiting the Capitol is made easy with the tools and resources provided in this FREE Oregon Capitol field trip printable we’ve created for you. You can use it any time of year or as the perfect addition to our Apple Pie Day field trip experience! Let’s Visit the Oregon State Capitol! 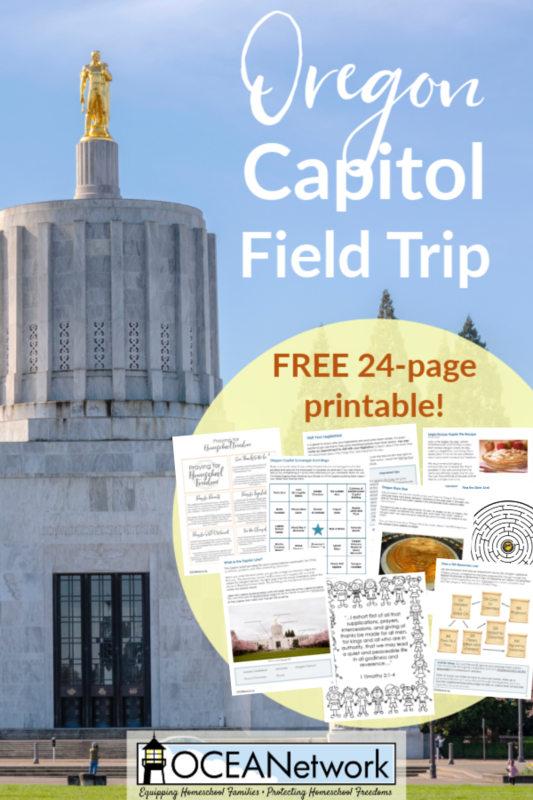 The printable pack provides fun activities that can be done before and during your Oregon Capitol field trip, such as a BINGO scavenger hunt, coloring pages, a maze, and more. There are post-field trip notebooking pages to record their memories and favorite parts of the trip. They will also learn about all the important work that is done at the Capitol, how to connect with their legislators, and even how to pray for representatives and for homeschool freedom in Oregon. So, let’s go! Take a field trip with us to the Oregon State Capitol! This packet will help you prepare and have a fun time while you’re there. Here is what’s included. It’s ideal for ages around 5-9, but can be easily extended for younger or older kids. What Makes the Oregon State Capitol Special? Join Us at Apple Pie Day! You can use this Oregon Capitol Field Trip Printable any time of year. However, it’s just perfect to use for our bi-annual event, Apple Pie Day! 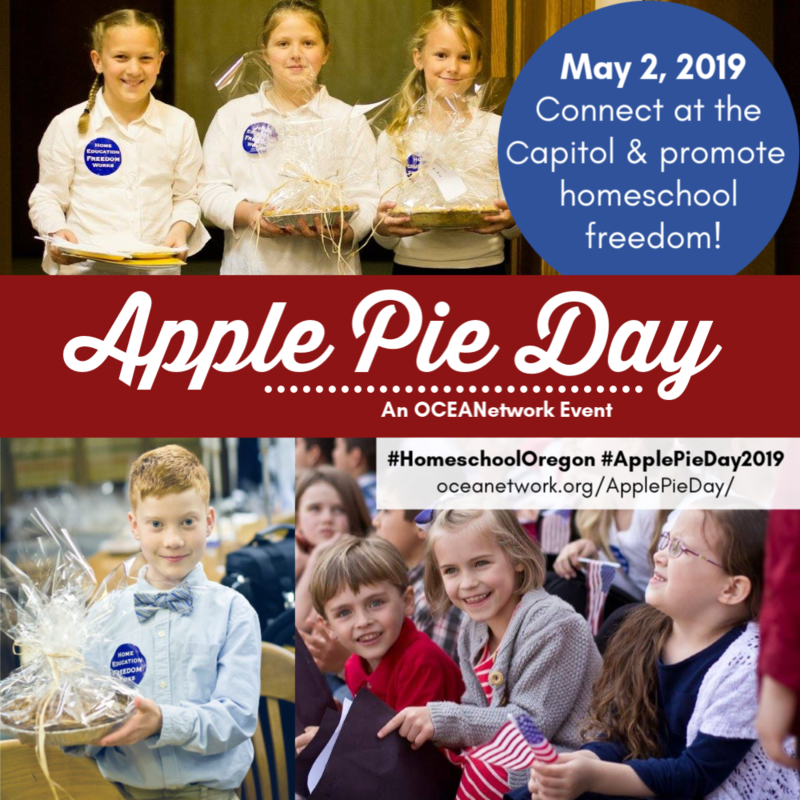 During every long legislative session (every other year) OCEANetwork hosts Apple Pie Day. It’s a legislative field trip where homeschoolers across Oregon come together, meet their legislators, tour the Capitol, enjoy a choir and noontime rally, and much more! The next Apple Pie Day is May 2, 2019! Be sure to make appointments NOW to see your legislators on Apple Pie Day, May 2. Plan to bake them an apple pie to bring with you when you visit. Then email us at ApplePieDay@gmail.com to let us know which legislators you are visiting and how many pies you are bringing. It’s sure to be educational and lots of fun! Find out more about Apple Pie Day here. 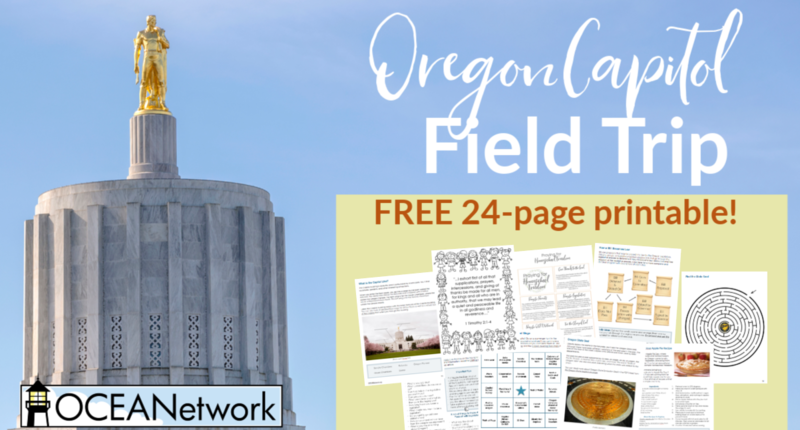 We are happy to offer you this free 24-page printable pack to help you prepare for and enjoy your field trip to the Oregon Capitol!